Here´s a simple warmer that never fails to get learners talking: Ask them to work with a partner or in a small group and say what they had for breakfast that morning. Tell them that it´s OK if they didn´t have anything for breakfast, they can tell their partner that instead and perhaps also explain why that was (if they feel comfortable sharing that). While they´re doing this learners can practise using food vocabulary and encourage them to ask you or check with a dictionary if they´re not sure what word they need for a particular food or drink item they want to say. This can lead into a discussion about whether not eating or skipping breakfast makes it more difficult to concentrate. Learners can also compare and contrast each other´s breakfasts, e.g. I usually only eat a small breakfast, but Juan always has a large breakfast. As you can see from the example above, this is also an opportunity to practise using frequency adverbs. If you would like to look at the topic of breakfast in a little more detail, you could also use this video “What does the world eat for breakfast.” Ask the learners to watch the video and make notes on the contents of breakfasts that they would like to eat and then ask them which breakfast they would most like to eat–they´re not allowed to choose the breakfast from their home country if it´s in the video. If there is a picture of breakfast in the learners´ home country or countries, you can ask them if this is really what people in that country eat. in combination with adjectives for food, e.g. large, small, salty, sweet, filling, light, plain, rich, spicy. The bacon in the British breakfast is too salty for me. The flatbread in the Egyptian breakfast isn´t sweet enough for me. The salsa in the Mexican breakfast is too spicy for me. Of course, this is also a good opportunity to focus on country names and nationalities. Encourage the learners to use the words for the nationalities of the countries when they´re describing and comparing the breakfasts. The following post accompanies a workshop presented by Claire Hart and Kristen Acquaviva at the TESOL Spain Annual National Convention 2014 in Madrid on 8th March 2014. Mobile learning, often shortened to m-learning, involves the use of mobile technologies to promote learning either inside or outside the classroom. Mobile learning is also learning that doesn´t have to occur in one fixed location–it is not tied to a specific place, such as the classroom. When we talk about mobile technologies we´re talking about a wide range of devices. The most basic mobile phone belongs to this group, as do mobile phones with camera functions and internet access and smartphones, which also enable you to use applications or apps to do specific things like look up the definitions of words. Mobile technologies are not only mobile phones or smartphones, they also include digital cameras, tablet computers and laptop computers or netbooks. A mobile device is, therefore, any device that you can use without having to be in a fixed location and which you can use to view, read, listen to, watch, find, generate, create, share or organise digital content, such as text, audio, video or images. These are the activities that learners engage in when we use mobile devices to promote learning. Due to the prevalence of mobile technologies in twenty-first century life, when you implement mobile learning with your learners you are usually giving them the chance to use technology that they are already familiar with and enjoy using in other contexts. The results are the increased relevance of lesson content and increased learner engagement with that content. Mobile learning can help to break down the walls between the classroom and the so-called “real world” and also make it easier for learning to happen outside of those walls. We can also expect to see a continued increase in mobile device ownership in the years to come, so even if only a small proportion of your learners have mobile devices now you can expect that number to go up. Mobile devices are likely to become as normal a part of the EFL or ESL classroom as a blackboard, whiteboard or flipchart during the course of the twentieth-first century. Not to be overlooked as a benefit of mobile learning, however, is the sheer range of learning opportunities that they can provide. You can view or create just about every form of media on a mobile device, you can also communicate with people from all over the world and access an unparalleled wealth of knowledge. How you access these mobile technologies will vary. In some teaching contexts, laptops and tablets are provided for teachers and learners to use, more often learners and teachers bring their own phones, tablets or other devices to the lesson and use those. If devices are provided by the institution where the EFL or ESL course is taking place, learners will usually all be working with the same version or generation of a device. The devices might not be their own and they might not be able to use them outside of the classroom. If you have to rely on learners to bring their own devices to the lesson, they will usually be more familiar with how they work and will already have their own photos, apps and emails on them. We can then make use of this content to create more personalised activities. However, in this situation you may also find that not all of the learners have their own devices. – When are you free next week? – Would you be free at 10am next Wednesday? / Would Wednesday at 10am work for you? – What about next Tuesday? / Is next Tuesday good for you? I´m afraid, I´m no longer free next Wednesday, could we meet on Thursday instead? I´m going to have to re-schedule our appointment–what about Tuesday afternoon? 2. 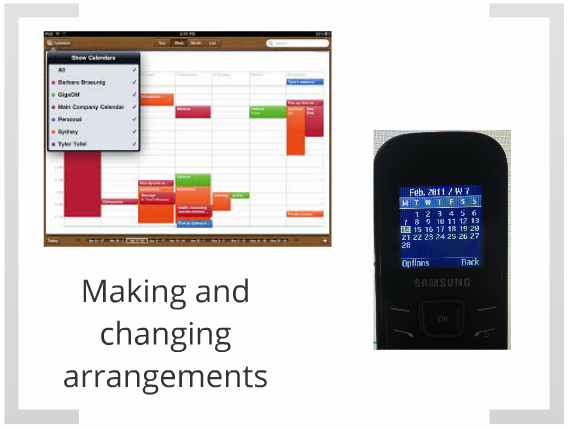 Learners take part in a simulation with a partner in which they look at their actual calendars on their phones, tablets or laptops and make an arrangement to meet. 3. They then have another conversation to change or reschedule the appointment or arrangement. If learners don´t usually use a calendar to record what they have to do, you might want to encourage them to fill in any appointments or blocks of time when they wouldn´t be available before you start this activity. 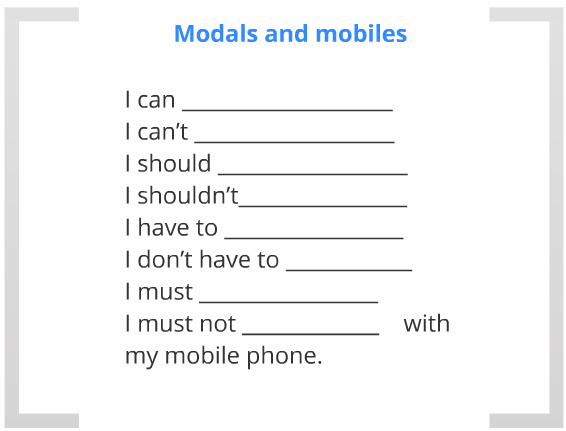 Use this exercise to practise and consolidate using modal verbs. The idea is simple: learners complete the sentences to give information about their mobile devices. They could choose any mobile device from a phone to a laptop, a digital camera or a tablet. – I can take photos with my phone. – I can´t use my phone when I´m underwater. – I shouldn´t drop my phone on the floor. – I don´t have to charge my phone up every day. e.g. this is the brand of glasses I wear, this is the brand of the pullover I´m wearing, this is on something I bought last weekend. Which of your brands are from companies based in your country and which are not? Are there any brands that we connect with specific countries? Which brands do you think are typical brands from your country and what messages do they communicate about it? Which of your brands are the most successful? You decide what makes a more or less successful brand. Do you find some of the brands more attractive than others, and, if so, why? 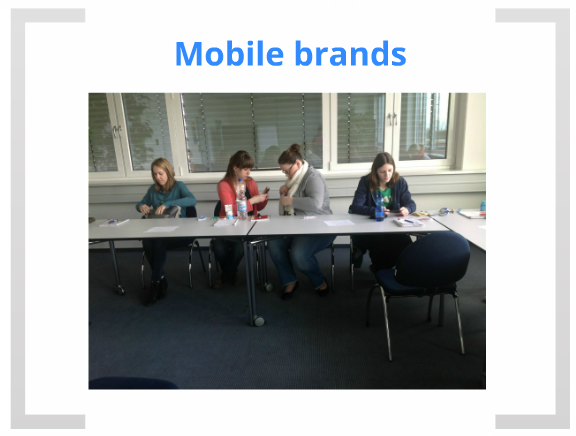 What about your company´s brand—what messages does it communicate? What are the target groups that it want to appeal to? How successful do you think your company´s brand is? Is there anything you could do that would make it more successful? 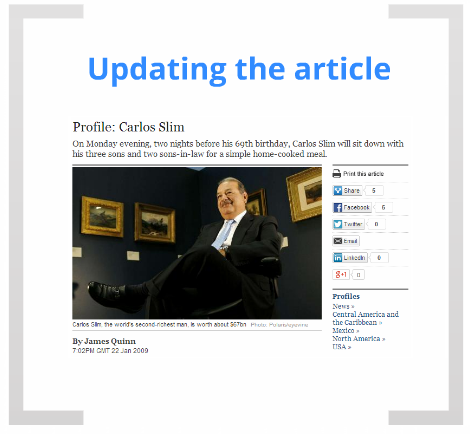 The articles we give learners to read were often written some time ago, so the idea of this activity is for learners to do their own research to find if anything has changed or anything new has happened since the article was written. 1. Learners read the article. 2. Learners use their mobile devices to go online and find out if anything has changed or anything is new with regard to the subject of the article since it was published. To do this, they need to be aware of when the article was published, of course. 3. Once they have the new information, learners then use it to write a final, extra paragraph for the article using the same style as the author of the article. 1. Ask the learners to work with a partner or in small groups and think back to times when they´ve wanted to start a conversation with someone about something and times when someone has been talking to them about something that they didn´t want to talk about. Now ask them to discuss what they did or said in those two situations and what you could do or say in those situations. The pairs or groups then feedback their ideas to the rest of the group for the teacher to write up on the board. a. Asking a question about the topic you want to talk about, e.g. Did you watch the game last night? b. Asking a question or making a comment connected to the room that you´re in or the situation you´re in, e.g. Is this seat free? What a wonderful buffet—the food´s great! c. Paying someone a compliment, e.g. I really like that scarf you´re wearing, where did you get it? d. Showing someone something or pointing something out, e.g. Look at those clouds, I think it´s going to rain again. Now ask the learners to discuss what they do and say or would do and say in a situation where they´re making conversation with someone and the person asks them a question they don´t want to answer such as: Why aren´t you married? The pairs or small groups then feed these ideas back to the rest of the group for the teacher to write up on the board. – Well, how much time have you got? Draw the learners´ attention to how we can use humour and softeners, such as “I´m not sure” or “I´m afraid” to deal with these kind of difficult questions. 1. Find someone who´s happy to talk to them about the thing they want to talk about. 2. Change the subject or politely leave the conversation if someone starts talking to them about the thing they don´t want to talk about. 3. Ask one other person their difficult question and respond to the difficult questions anybody else asks them. See sample cards below. These sample cards have been designed for a group of eight students, but if you have more or less than eight students remember that the important thing is that there should be at least one person who doesn´t want to talk about something that another student wants to talk about. The learners then have to talk to each other. They can start by sitting down and talking to the people near to them, but remind them that the person who´s happy to talk to them about the thing they want to talk about may be in another part of the room so they will have to get up and move around and talk to other people in group too. The teacher should do their best to distribute the cards so that learners have to move around. Encourage the learners to keep talking and remind them that everyone needs to ask at least one other person their difficult question. When everyone in the group has been able to have a conversation with someone who didn´t want to change the subject or leave the conversation and everyone has asked their difficult questions, you can ask the learners to go back to their original seats. Have them tell you who they found to talk to, what they talked about and if they learned anything new about their conversation partner. Then ask them how successfully they were able to change the subject or leave a conversation (How do they know that they were successful or unsuccessful?) and how they dealt with the difficult questions they were asked. Then ask the learners to discuss which of the difficult questions they thought were the worst or the most taboo and which they thought that it would be acceptable to ask in a small talk situation. Encourage them to reflect on how the level of appropriateness would be also be dependent on the type of situation they´re in and their relationship with the person they´re talking to. Cultural issues is another area that could be explored here, i.e. looking at how people from different cultures would find some questions more or less appropriate. – Ask someone who isn´t married why they´re not married. – Find out how much money someone else earns or how much money they have to live on. – Find out if someone else has a car. If they do, ask them what type of car it is. If they don´t ask them why they don´t have a car. – Ask someone who lives in a village why they don´t live in a bigger town or city. – Ask someone who doesn´t have children why they don´t. – Ask someone where they bought something they´re wearing. – Ask someone else what kind of phone they have and what they can do with it. – Ask someone else in the group why they need to have a smartphone—wouldn´t they be able to do everything they need to do with a basic phone like yours? For this activity the learners need to have a device with them that they can use to take photos, e.g. a phone with a camera, a tablet with a camera or a digital camera. The first step is to ask the learners to take photos of 6 images of brands that they can find on their clothes, on things they have in their bags or anywhere around them in the room where they are. The learners then show each other their brands and they could do this either by showing the photos on their phone, tablet or digital camera, by arranging the images on a Word document to present to their partner or by using a web tool to present them such as Glogster (a web tool that helps you create posters) or Padlet (a web tool that allows you to organise content on a blank “wall”). Below you´ll find an example of some images that I took. a. The learners explain to their partner which brands the images represent and what their connections to the brands are while their partner practises active listening and can ask questions to clarify information or find out more. Kinder is a chocolate manufacturer based in Germany and I really enjoy the smooth and creamy taste of their chocolate. Whenever I go to Germany I always buy some Kinder bars to bring back with me. b. The learners ask each other questions to find out more about the brands their partner has chosen and why they have chosen them. Do you like Kinder chocolate? What´s your favourite type of chocolate? What did you buy from Apple? So, what´s the connection between you and Dachser Logistics? What piece of clothing did you buy at the Gerry Weber shop? 4. This can be followed up with a group feedback session and possibly by some further work on the brands chosen, e.g. learners could find out more about one of the brands and give a presentation about it or they could discuss the relative success and popularity of the different brands and debate what makes a successful or popular brand. All levels from intermediate to advanced. Write “What is success?” on the board. Tell the learners to work in pairs or small groups and brainstorm the words they think of when they think of success. Ask them to focus on what makes a person a success. Show the learners photos of the six people below. Ask them to identify the people from their photos (or to speculate about who they are if there are people they don´t know) and tell you what they know about them. Then, as a group, ask them to use their criteria to agree on a success rating for each person from 1 to 10 (10 is the highest, 1 the lowest), reaching a consensus or at least a compromise. Have the learners give reasons and explanations for choosing the rating that they wanted to give each person. Now ask the learners to discuss in pairs or small groups which of these six people they think is the most successful and why. Suggest some questions that they could use to guide their decision, e.g. Who has the most money? Who´s the most famous? Who has the most power? Who´s the most respected? Who has won the most valuable prize or award? Learners then share and compare their choices with the rest of the group. Finally, ask the learners to suggest other people, either living or dead, famous or unknown, who they think are or were a success, giving reasons for their choices.